Made with soft, lightweight, superior performance fabric, the Women’s Zobha Short Sleeve V-Neck Shirt is simple style and function in one sweet tee. Excellent for the gym of for a summer morning run along the river, this tee comes stretches to hip length in order to give you full coverage and concentration while you’re doing your thing. Plus, the Zobha Short Sleeve V-Neck Shirt for women uses widened cuffs to help keep sleeves in place, so you can move with ease and peace of mind. Made with soft, lightweight, superior performance fabric, the Women’s Zobha Short Sleeve V-Neck Shirt is simple style and function in one sweet tee. Excellent for the gym or for a morning run along the river, this tee stretches to hip length in order to give you full coverage while you’re working out. 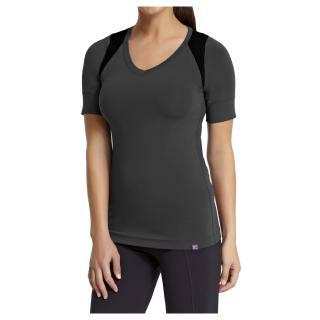 The Zobha Short Sleeve V-Neck Shirt for women uses widened cuffs to help keep sleeves in place, so you can move with ease and peace of mind.